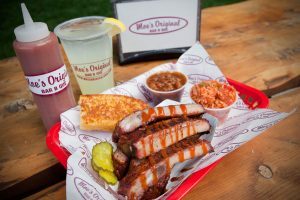 Moe’s Original Bar B Que is a Southern soul food revival. Guests can enjoy award-winning Bama-style pulled pork, ribs, wings, turkey and chicken smoked over hardwood served with two unique sauces in addition to catfish, tempeh and a shrimp sandwich. Additionally, several traditional Southern sides and tasty desserts are served fresh daily from recipes passed down for generations. Providing a kid-friendly environment in a quaint neighborhood setting, this fast casual eatery also hase a full bar complete with TVs showing concerts or sports.